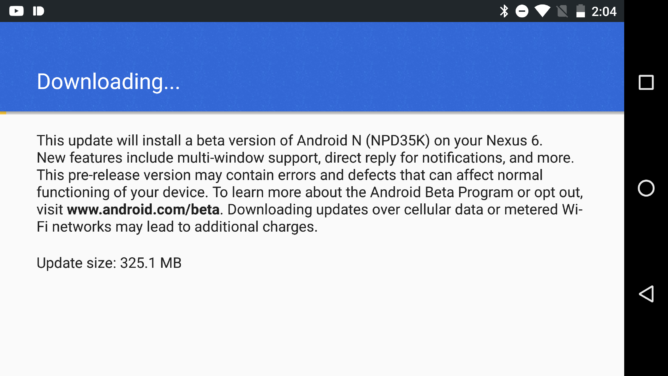 Google and the AOSP development team have released yet another update to its stunning Android N beta program taking it to the version Android N Developer Preview 3. It introduces new features, bug fixes and makes it even more stable. As you can see that Android N is the latest project from AOSP bringing a new test operating system to the Nexus devices like Nexus 6P, 5X, 6, 9, 9G, Nexus Player and the Pixel C along with some Android One devices with the latest firmware build NPD35K. Following the Android N version 1 and the Android N Developer Preview 2, here are the OTA and factory images for the new DP 3. What’s New in Android N Developer Preview 3? VR Mode for Android: Android N brings a new VR Mode platform support and optimization that would enable developers to build high-quality mobile VR experiences for the users. Multiprocess WebView: Starting with Android N version 51, WebView will run web content in a separate sandboxed process. This option can be enabled from the developer option> Multiprocess WebView. Sustained Performance Mode: Sustained performance mode has been incorporated into Android N Developer Preview 2. This will enable OEM to provide device performance capabilities for long running applications. As Google earlier announced that this version of the preview would bring more stability and the tech giant also encouraged developers to install it on their primary devices. The dev preview should most likely come with the preliminary version of the Daydream VR dev tools and revamped recent apps activity to handle background running apps more efficiently. There are quite some ways to get the latest Android N Developer Preview 3 build on your Nexus series and Android One devices. If you are on the latest Android 6.0.1 Marshmallow firmware, then the most efficient way is the OTA sign up program for the Android N OTA notification. Similarly, if for some reason your device doesn’t notify you of the Preview 3 NPD35K update, then grab the OTA images from below and follow the instructions from the tutorial with the adb sideload method or the stock recovery method. Moreover, you can simply grab the factory images and flash it using the tutorial from below. The factory image will perform a clean install and restore your Nexus device to completely stock with Android N. These update files come officially from Google’s developer page. The images are live for most devices and we will be updating more as they are available. So stay tuned. How to Install Android N Developer Preview 3 With Factory Image File On Nexus devices? To know how to install OTA on Nexus devices, check out this tutorial: How to Install Android OTA on Nexus Devices Using ADB Sideload or Stock Recovery. How to Install Android N Developer Preview 3 With OTA Update Image Files On Nexus devices? To know how to install Factory images on nexus devices, check out this tutorial: How to Install Android N Developer Preview on Nexus Devices. See: How to Root Android N Developer Preview With SuperSU And CF Auto Root. Like and share us on social media. For queries, comment down below.